"We're human beings. We're not computers. We have a conscience." That quote from George Clooney is from Money Monster, one of the best & most original thrillers of the decade. 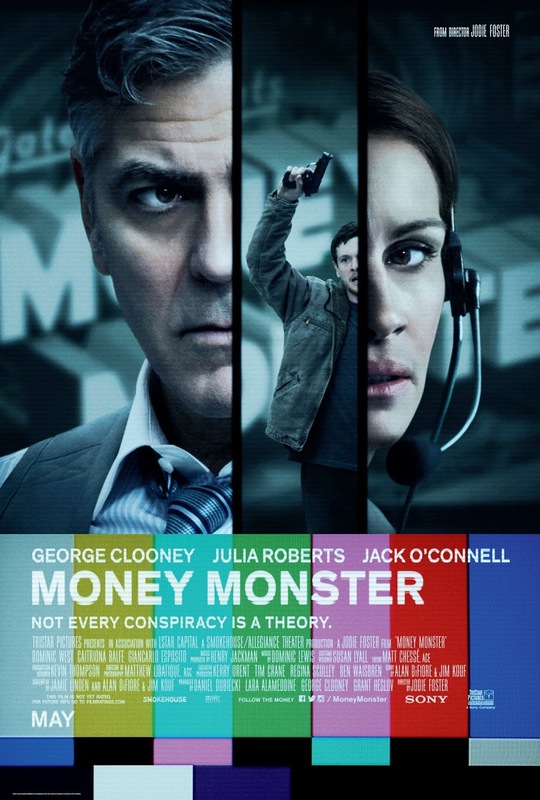 Clooney plays Lee Gates, a Jim Cramer-esque host of the TV show, Money Monster. His longtime director, Patty Fenn (played by Julia Roberts) is leaving after the day's show. IBIS Clear Capital CEO Walt Camby (played by Dominic West) is scheduled to be on the show to be interviewed about a crash caused by a glitch that cost investors $800 million. However, Camby is on a plane to Geneva. Midway through the show, Gates is taken hostage by Kyle Budwell (played by Jack O'Connell), an irate investor who lost $60,000 that he inherited from his late mother due to the crash, money he invested after Gates endorsed IBIS a month ago. He forces Gates to put on a vest filled with explosives. If Gates doesn't give Budwell any answers, Budwell will detonate the explosives. Now, Gates, Fenn & Budwell, along with IBIS PR head Diane Lester (played by Caitriona Balfe), must find the answers about what went wrong, discovering a web of lies & deceit. The film was excellent. Clooney, Roberts, O'Connell, West & Balfe were excellent. The direction from Jodie Foster was extremely well-done, along with the screenplay from Alan Di Fiore, Jim Kouf & Jamie Linden. The editing was excellent, brilliantly assembling the film's use of real-time. This is definitely an excellent thriller.